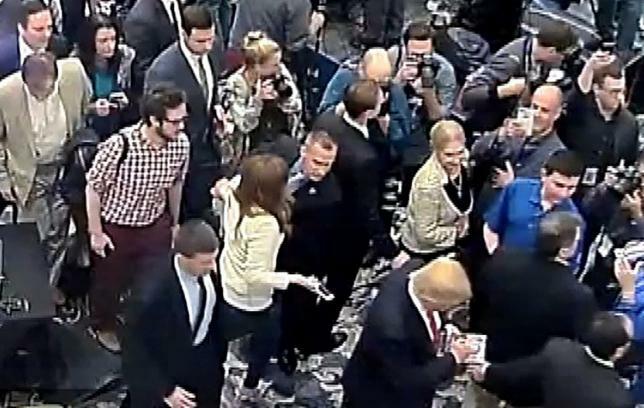 Police in Jupiter, Florida, charged Corey Lewandowski, 42, with intentionally grabbing and bruising the arm of Michelle Fields, then a reporter for the conservative news outlet Breitbart, when she tried to question Trump at a campaign event on March 8. . .
Police released a video of the incident showing Fields walking alongside Trump and trying to question him. Lewandowski is seen grabbing her arm and pulling her backward. Previous videos of the incident had been obscured by people in the crowd. At the time, Lewandowski called Fields “delusional” and said he never touched her. A court date was set for May 4, according to the police report. Jupiter police said Lewandowski turned himself in, and he was issued a notice requiring him to appear in court and then released. He was not booked into the jail. Trump appeared on CNN, trying to defend Lewandowski. He had Anderson Cooper read Fields’ original statement, which said that she was nearly thrown to the ground. Trump said she changed her story once she realized there was video. In fact, Trump says Fields was grabbing him, and Lewandowski was just defending Trump. Breitbart, which has been known for supporting Trump, was not supportive of Field’s story. In fact, one of her coworkers doubted her on Twitter. The morning after Breitbart reporter Michelle Fields published her account of being manhandled by Donald Trump’s campaign manager, one of her colleagues took to Twitter to publicly cast doubt on her story. “I’ve been reporting for Breitbart at Trump rallies and no one ever grabbed my shoulder and everyone was nice,” Patrick Howley wrote Thursday morning, reacting to Fields’ story of getting pulled down by Trump’s manager Corey Lewandowski. “I think the reporter whose shoulder allegedly got grabbed should release video of the incident,” he added, without naming Fields directly. The dispute caused an uproar at Breitbart. Fields quit, in protest—along with three other staffers, according to NBC. Breitbart reporter Michelle Fields has resigned from the conservative news site over its response to her alleged assault by Donald Trump’s campaign manager. Three of her colleagues also resigned from Breitbart: editor-at-large Ben Shapiro, national security reporter Jordan Schachtel and Jarrett Stepman, an editor. In his departing statement on Sunday, Shapiro said the site should be “ashamed” of “their treatment” of Fields. Typically, Trump tweeted, wondering if he should press charges for being “manhandled” by Fields. So we seem to have general agreement about what happened. But few people are asking about why Lewandowski jumped in. In her own words, the question was about Trump’s stand on affirmative action. Is this an issue which should occupy so much coverage in a presidential campaign? What do you think, who is correct? How about the 12 delegates that Trump was “Finally” awarded in Missouri… why hasn’t that been updated on the site? Also with this story. She clearly was pulled back but it wasn’t agressive cause he quickly went right by her. I guess if you touch someone, it’s called “Battery”. Her story of being almost thrown to the ground is false reporting and she should of been fired but probably was given that option to quit. The guy will be the unjust Fine for touching her.. but Trump can put a reistrating order out on her incase she gets another job and goes to 1 of his next press conferences. Delegate count updated. I update things regularly as quickly as I can. You know that being “almost thrown to the ground” means that you weren’t thrown to the ground, right? Taken in perspective of the day’s further developments – punishment for women who seek abortions, teen protestor at his rally groped and pepper sprayed – this issue is, indeed, YUGE… Most women have had enough: CNN poll before this showed 73 percent of all women voters have unfavorable view of him. Now when will the men who love women follow suit and decline Trump’s charms? My intuition says he will never make it to the presidential ballot. What I think is that the establishment money will do anything, even ridiculous things like this, to demonize Mr. Trump, who severely threatens their criminal game. Yes, there is a clause in the Constitution for that, right? Even if you’re implied consent crap was true, Lewandowski isn’t security. He’s the campaign manager. He could have been fired for not protecting his boss and claiming it wasn’t part of his job contract.